mid-century | Oh, The Glamourous Life! Back in November, I wrote of my quest to prove the vintage recipe testers at Buzzfeed wrong and of the results of my first experiment, Olive-Cheese “Porcupine”. 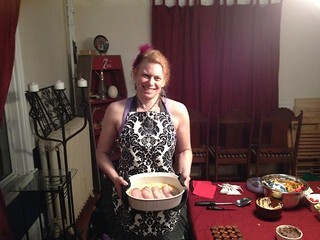 At that very same party, I also made a ham and banana dish. I had to do this at a party, because I wanted the feedback from several palates but also because I hate bananas. I didn’t actually use the same recipe as the Buzzfeed folks. I could tell that theirs was going to be disgusting no matter how good a cook I am, so I found one that was similar, to prove that the recipe was at fault, not the dish concept. 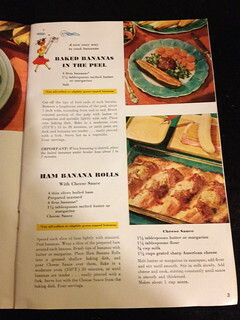 I used the recipe for Ham Banana Rolls with Cheese Sauce from a Chiquita Banana’s Recipe Book from 1950 while they made Ham and Bananas Hollandaise from the McCall’s Great American Recipe Card Collection from 1973. I’ll explain as I go how the two diverged. Both recipes begin about the same. Take slices of boiled ham and spread with mustard. My recipe left the amount of mustard up to the cook, while theirs specified a teaspoon and a half per slice. I just covered each slice with a thin, even coating. Diverging from both recipes, I used baked ham instead of boiled, because I was going to be making my lunch out of the left-over meat and I don’t like boiled ham. Does anyone? Also, back when they probably used French’s yellow, but I used a brown deli mustard. I wrapped the bananas in the mustard-smeared ham and then brushed the bare banana tips with melted butter. Their recipe says to sprinkle the bananas with lemon juice to keep them from browning (not so necessary I thought) before wrapping the bananas. In both cases the wrapped bananas go into a greased, shallow baking dish. Now things get very different. Their bananas are baked at 400F for 10 minutes. I baked my bananas at 350F for 30 minutes, but first I had to pour cheese sauce over them. The cheese sauce is really easy. Make a roux with butter and flour, then add milk. Then add grated cheese and cook until it’s all smooth and hot. I confess, I used sharp cheddar instead of the called-for sharp American because I already had a bag of shredded cheddar for the porcupine (and I like it better). That’s it for my recipe, but theirs has one more step. You mix an envelope of hollandaise sauce mix with some water, cream, and lemon juice bring it to a boil. Pour over the bananas and bake 5 minutes more. Here’s a gratuitous picture of the chef with the finished product. My taste-testers wrote “This is something I will get a craving for in the future. So great!” and “Awesome combo. Maybe need more salt or sharpness but this is one of those surprising flavor combos I’m glad I tried.” Those who liked bananas really liked the bananas. They were nice and creamy and had transformed from “hot banana” into something very tasty. Those who liked ham liked that too, especially the part that was above the cheese sauce, as it got crispy and brown. The part of the ham that was completely submerged in the sauce was not as good, since it never browned. The mustard flavor didn’t blend well with the ham & banana and was a touch assertive. The cheese sauce was a little bland. 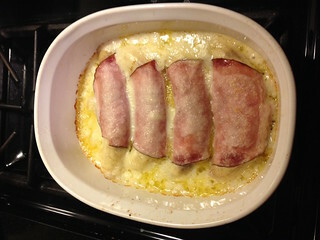 If I were to make this again, I’d add some dry mustard to the cheese sauce (and salt & pepper), shred the ham and sprinkle it on top of the bananas, instead of wrapping it around. It doesn’t make for as nice, tidy, and midcentury a presentation, but it solves all the problems above while keeping the good parts. I’m not surprised that the Buzzfeed version got low marks. To start I think they followed the recipe to the letter and used boiled ham and yellow mustard. Although their bananas cook at a higher temperature, it’s for half the time. They probably didn’t get creamy and slightly caramelized like mine did. Also, they were cooked without the sauce, just having been seasoned with lemon juice, which I think was totally unnecessary. I doubt the bananas were going to get oxidized in the short time from peel to pan. Perhaps the recipe was deliberately trying to amp the lemon flavor. Also, I think brushing the exposed banana bits with butter in my recipe improved the flavor and helped them brown. Lastly, and most importantly, I think their hollandaise sauce was a loser from the get-go. 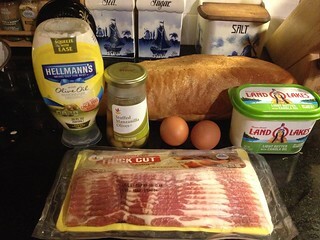 Maybe it could have been okay with an actual freshly made hollandaise, but a mix was right out. I’m sure adding extra lemon juice to an already lemon-flavored sauce mix didn’t help. I’m not sure why the recipe creator thought ham, banana, and lemon was going to be delicious. I know hollandaise was pretty popular in the ’70s. I’m sure it was seen as more chic than a pedestrian cheese sauce. So don’t every try the 1973 version with hollandaise, but the 1950 version with cheese sauce is actually worth making. Spread each slice of ham lightly with mustard. Peel bananas. Wrap a slice of prepared ham around each banana. Brush tips of bananas with butter or margarine. 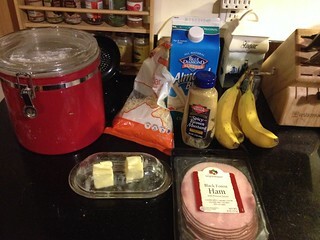 Place Ham Banana Rolls into a greased shallow baking dish, and pour Cheese Sauce over them. Bake in a moderate oven (350°F) 30 minutes, or until bananas are tender… easily pierced with a fork. Serve hot with the Cheese Sauce from the baking dish. Melt butter or margarine in saucepan; add flour and stir until smooth. Stir in milk slowly. Add cheese and cook, stirring constantly until sauce in smooth and thickened. I’ll need to throw another party soon to try some of the other recipes. Recently Eva (she played Blanche in The Wrathskellar) pointed me at a Buzzfeed article where the authors cooked and tasted some “vintage” recipes (ranging from 1955 to 1973) and found them disgusting. Knowing my love of the midcentury, Eva called on me to defend the honor of these maligned dishes. I’m going to do my best. Since we were having a wrap party for The Wrathskellar, that seemed like a perfect opportunity to inflict serve some of these tempting treats. 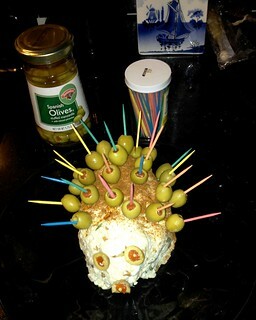 First up the Olive-Cheese “Porcupine”. I’ve made cheese balls for parties before and I wasn’t quite sure how this could be bad, unless you used poor-quality cheese. Because the party was just cast and crew, I made a half-recipe. I probably could have made a quarter. It’s a generously sized cheese ball. 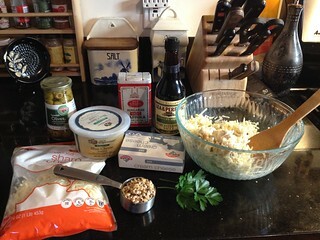 I gathered my ingredients: cream cheese, crumbled blue cheese, shredded sharp cheddar, onion (not pictured because I’m a dimwit), Worcestershire sauce, chopped walnuts, and parsley. The onion and parsley got chopped finely and the walnuts toasted (nuts are always better toasted). The cheese was allowed to come to room temperature. The recipe didn’t say how much parsley, so I added about a tablespoon. Everything was tossed in the mixing bowl and combined. I ended up smushing it together with my hands. Then it was molded into a rough porcupine shape, wrapped in plastic (like Laura Palmer) and stuck in the fridge for a few hours. 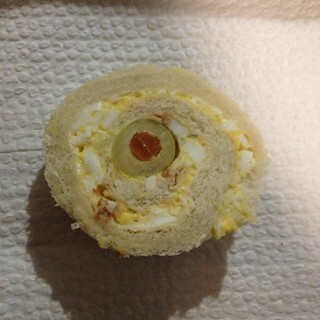 Here’s the little darling in all his glory, sprinkled with paprika and adorned with olives. I used multicolored toothpicks for extra festivity and Spanish olives, as the recipe called for, and not those nasty black olives in a can like the Buzzfeeders. It was indeed tasty, if a bit bland, which I suspected was going to be the case, tasting most strongly of the blue cheese. If I were to make this again, I would stick with the ratio of cheeses, but up the quantities of the onion, Worcestershire sauce, and parsley. The walnuts were probably about right. Also, I might add a dash of Tabasco. 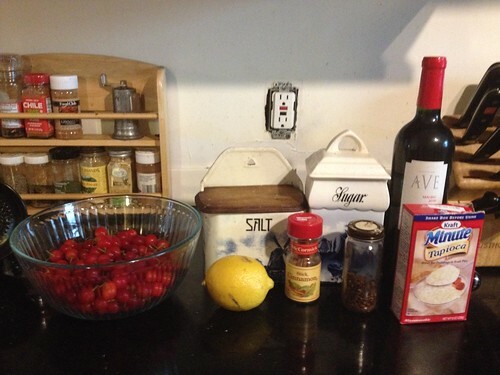 The olives were only there because the recipe was trying to sell Imported Spanish Olives. I think they could be left off without any harm. Also, if it were a larger party, I think multiple small porcupines instead of one big one. It’s cuter. What do I think of the report that started this all? Not much. Well, it’s a cheese ball; of course it’s just cheese. Had they never encountered a cheese ball at a party before? One person said: “How do you even ruin cheese?” How did they? This is a super-simple, if plainly flavored, cheese spread. My only guess is that none of them knows how to cook and that they used cheap crappy cheese. On a different dish they noted with pride that they used the cheapest imitation crab they could find instead of the shrimp the recipe called for. I would consider Olive-Cheese “Porcupine” to be redeemed. Allow cheese to soften at room temperature. Mix with parsley, onion, Worcestershire sauce, nuts. On waxed paper form mixture into oval shape. Refrigerate 2 hours. Roll “porcupine” in paprika. Let stand at room temperature 1/2 hour before serving. 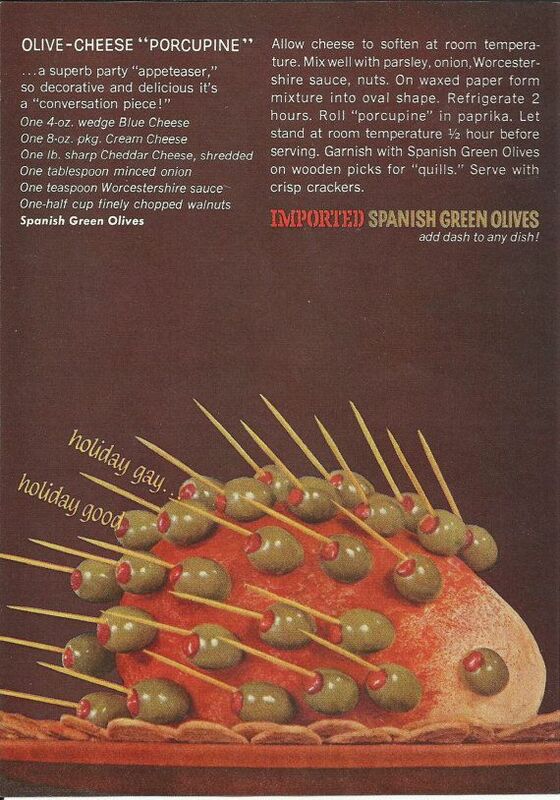 Garnish with Spanish Green Olives on wooden picks for “quills”. Serve with crisp crackers. Lest you think the Olive-Cheese “Porcupine” was invented by the Spanish Olive Council, here’s a cheese porcupine from 1964, made of cream cheese and butter, flavored with beer, decorated with breadcrumbs and pretzel sticks for quills. I’ve got one more recipe that I made at the party to report on and I’ll be trying even more as soon as I can find an occasion and an audience. 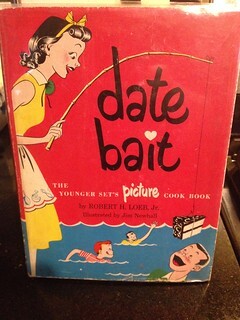 I recently made dinner based on a menu in a little cookbook from 1950, Meals for Two Cookbook. 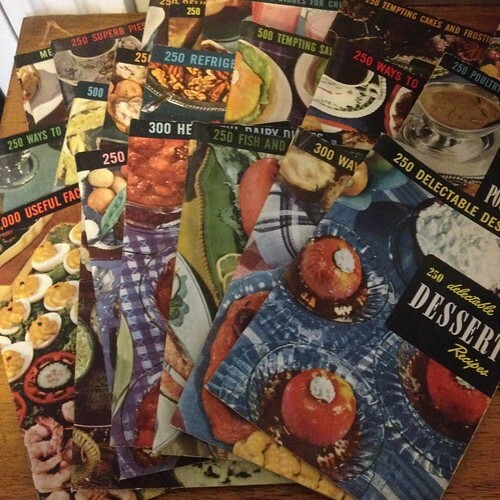 True confession, I just used the menu as a guideline and made similar dishes from other vintage cookbooks in my collection. The entree (Lamb en Brochette) was from an undated “postwar” butcher’s pamphlet, the vegetable (Épinard à l’italienne) was from a 1947 cookbook, and the bread (Sweet Potato Biscuits) came from a 1935 baking powder pamphlet. 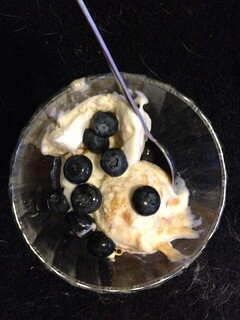 Dessert, however, did come from the original cookbook and that’s what I want to share with you. Dessert was Peach Mousse and I was intrigued. Usually when I make mousse, it involves whipping heavy cream or egg whites (or both) and maybe a little gelatin to stabilize. This used evaporated milk, a substance I’d never had in my kitchen before, and it was a frozen dessert. 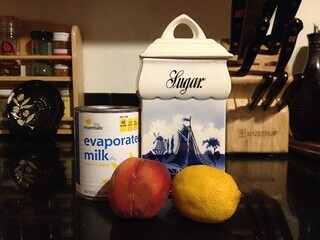 The ingredients are simple: peaches, sugar, evaporated milk, lemon juice, and a dash of salt (the salt box is hiding behind the other ingredients — I forgot to move it into the shot). Peel the peaches and mash them to make 3/4 cup of puree. That was about a peach and a half in my case. Add some sugar and stir until it dissolves. The recipe says to whisk the chilled milk until stiff. This is terribly amusing. I was using my trusty hand mixer and while the milk thickened, it was nowhere near stiff. 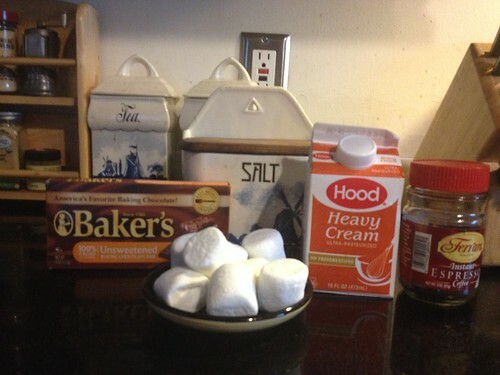 After a little research I discovered that whipping evaporated milk needs a little special prep. Put the milk, bowl, and beaters into the freezer for half an hour. Then beat for only a few minutes. I did get soft peaks, but I’d never call it stiff. I couldn’t imagine this working with a whisk at all. Fold in the peach puree, lemon juice, and salt and stick in the freezer. I put it in smaller, lidded container to freeze. That night it was in the freezer for maybe 5 hours and it was still soft at dessert time. 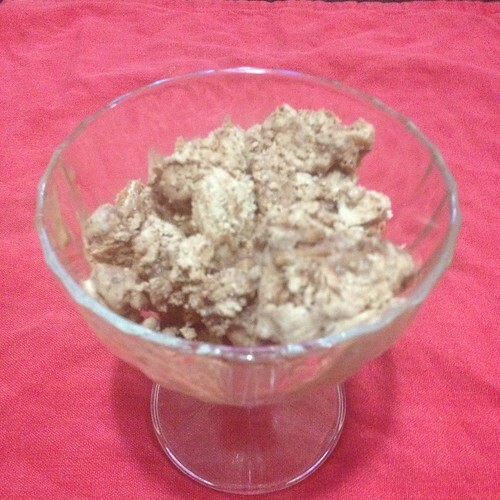 A couple days later, it was very hard and probably wanted to spend a little time at room temperature before scooping. It’s more like ice cream than mousse, but so deliciously peachy that who cares. It’s easy to make, as long as you properly chill the milk. The actual preparation is pretty fast, although you’ve got to wait hours for it to harden up enough to serve. 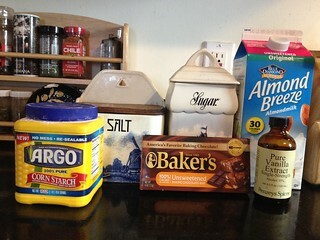 Pour evaporated milk into a bowl (preferably metal) and put it and the mixer’s beaters in the freezer for 30 minutes. Peel and stone the peaches and mash to get 3/4 cup puree. Add the sugar and stir until sugar is dissolved. Whip the milk for just about three minutes, until it resembles whipped cream. Fold in the peach mixture, lemon juice, and salt. 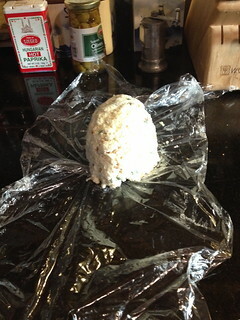 Cover and freeze for several hours, until firm. There’s a variation that uses bananas instead of peaches. I loathe bananas, but maybe I can find some brave taste-testers. Yesterday I wrote about making Cashew Chicken from a cookbook published by nuns in the mid-50’s. 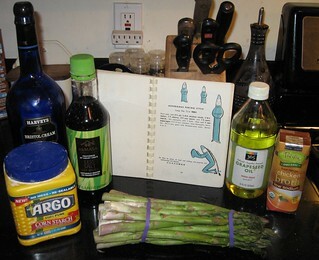 Today’s recipe is Asparagus Peking Style. 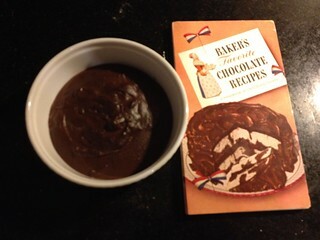 In this case I made the recipe almost exactly as writ, with one big exception. It called for a can of asparagus and I just can’t do that, even in the spirit of tasting history. I had to use fresh asparagus. Sorry to all those purists out there. Asparagus, sherry*, soy sauce, corn starch, chicken broth, and oil. I remembered to put the oil in this picture! Since the recipe called for canned asparagus and I was using fresh, I had to do a little prep work before I could get started. I snapped the tough ends of the asparagus (it’s fun!) and blanched them. Some people advocate blanching the asparagus standing up, but I think that takes way too much time and water. I like to throw them in a little boiling water in a big skillet, presumably the same one they’re going to get cooked in later, to save on dish washing. After a few minutes the asparagus turns bright green and is tender. Don’t let it overcook. Drain the asparagus and run some cold water over it to stop the cooking process. Then mix up the oil, broth, some water, sherry, soy sauce, and cornstarch in the pan and bring to a boil. 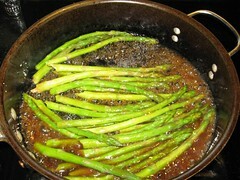 When it’s bubbling away, toss in the asparagus and cook until it’s hot. The sauce will be really thick, bordering on gloppy. Serve. And here’s the recipe with measurements and stuff. Prepare asparagus by snapping off tough lower stems. 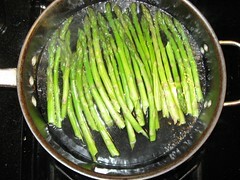 Blanch the asparagus in boiling water for a few minutes until the stems are bright green and tender. Drain asparagus and set aside. This can be done in advance. Or you could just use canned asparagus, like the original recipe. Heat pan and add all ingredients except asparagus. Bring to a boil, stirring constantly. 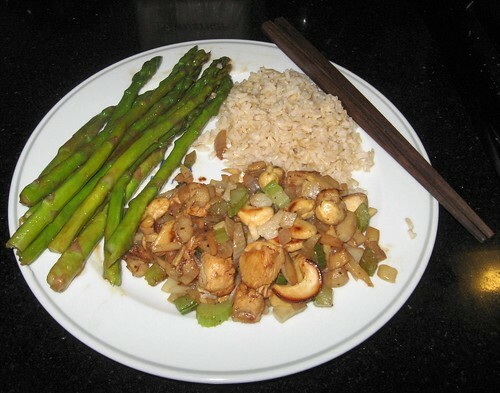 And here’s the whole meal: Cashew Chicken, Asparagus Peking Style, and brown rice. This picture doesn’t show the beauty of my zebrawood chopsticks**. *In the last missive I decided not to use cream sherry because it was so sweet and instead used rice wine vinegar. A few minutes later I changed my mind, thinking that it was likely that cream sherry was the sort that your average 1950’s housewife had on hand and that was the target audience for this cookbook. **I need a food stylist. And a better camera.